Normally, agents connect to a relay-enabled agent to get security updates. But if you have agents installed on roaming computers that are not always in contact with a Deep Security Manager or relay, you can select Allow Agents/Appliances to download Pattern updates directly from Primary Security Update Source if Relays are not accessible to allow agents to use the update source specified in the previous step when their relay group is not available. Normally, the Deep Security Manager instructs agents or appliances to download pattern updates. When Allow Agents/Appliances to download Pattern updates when Deep Security Manager is not accessible is selected, even though an agent cannot communicate with the Deep Security Manager, it will continue to download updates from its configured source. 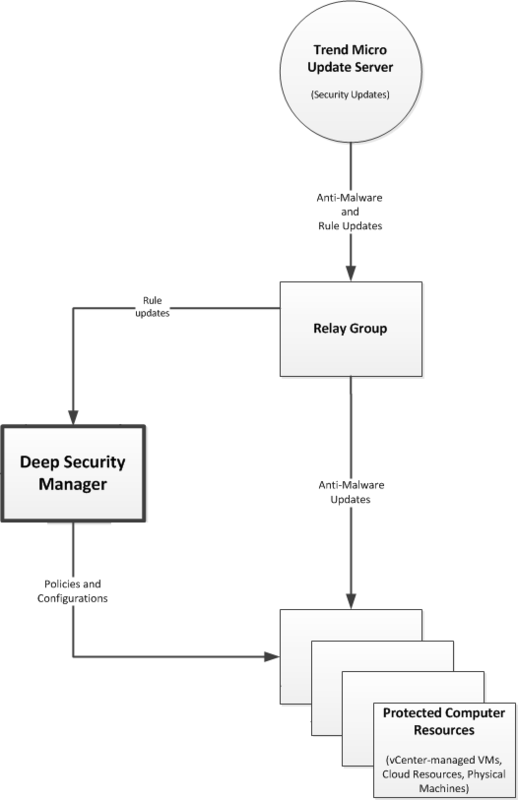 In a typical environment, at least one relay-enabled agent is configured and able to download updates from the Trend Micro Update Server and the rest of the agents and appliances connect to that relay-enabled agent for update distribution. However, if your relay-enabled agent cannot to connect to the Update Server over the Internet, you'll need to set up a relay in your demilitarized zone (DMZ) that can obtain the security updates, which you can then copy to your air-gapped relays. For details, see Configure agents that have no Internet access.